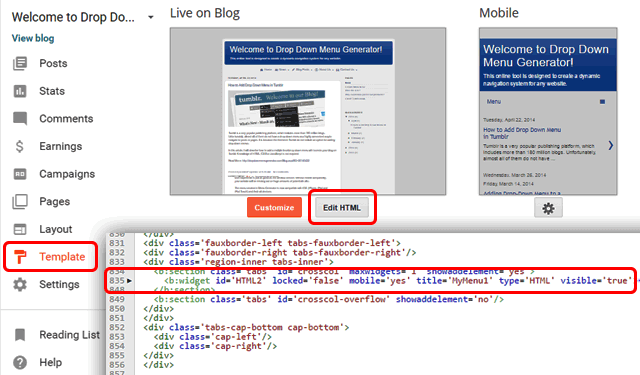 First of all, we need to take into account that Blogger uses a separate template for mobile layout. If your blog is opened on a mobile device, Blogger displays it in a compact view optimized for small screens. A mobile template has a logo, a simple drop down list for navigation, and the list with blog posts. Our task is to make the current drop down menu user-friendly to mobile visitors and add it to the mobile template. A responsive menu is such navigation component, which is user-friendly for both desktop and mobile users. How does it work? If the viewport width is less than the width of the menu bar, an alternate compact menu appears. So, the menu provides a quality experience for all of the users. By default, the menu created in Drop Down Menu Generator is not responsive. To make it responsive, you should enable the "Responsive Menu" option under the "Options" tab. To be sure that the menu is responsive, open it in the preview window in Menu Generator and set the window width less than the width of your menu. As you use Embed Code, your blog already has the responsive menu because any modification made to the menu in Menu Generator is immediately reflected in the menu on your blog. Open Blog Layout and find the widget with your menu. In my example blog, the menu is in the "MyMenu1" widget. Now the menu widget is enabled for the mobile view. 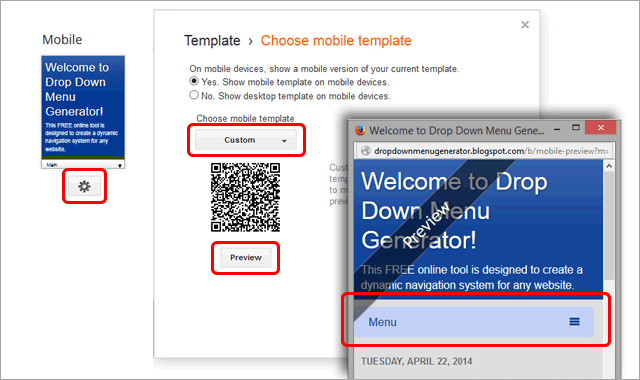 Finally, click the Gear icon below the mobile template and choose the Custom Mobile Template. Click on the Preview button to see the mobile version of your blog which now displays your responsive menu under the header. That's All! 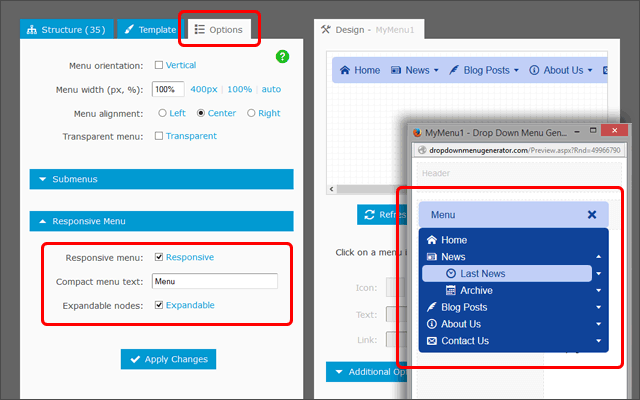 A single menu instance is used for both desktop and mobile versions of your blog. Any modification made to the menu for desktop users will be immediately reflected in the menu for mobile users.